Enchiladas make a hearty meal in a hurry with a bit of advance prep work. I typically make 1-2 quart batches of chile paste to have on hand for all sorts of dishes we like. I always have good stock in the freezer. We are fortunate to have some nice venison in the freezer after last year’s hunting season. 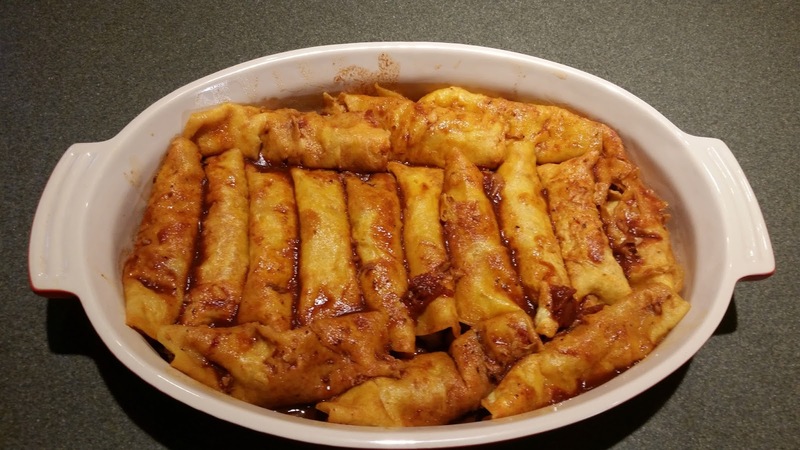 Add some tortillas, cheese, a pint of canned tomatoes, some garlic, an onion, and basic herbs and spices, and that’s all that is needed to make great Enchiladas Coloradas. For this version, I used venison. You can use beef, pork, or chicken as well. I used a top round roast, a muscle from the hind leg. Trimmed, this is about a 2-3 pound piece of meat. Cut it into 1” cubes. Place in a large sauce pan. Cover with water. Add 1T sea salt, 1t fresh ground black pepper, 1T Mexican oregano, ½ t ground cumin, 4 smashed cloves of garlic. Add 2 T of good vinegar. I used some vinegar my good friend Jim Tyndall made from some mead. 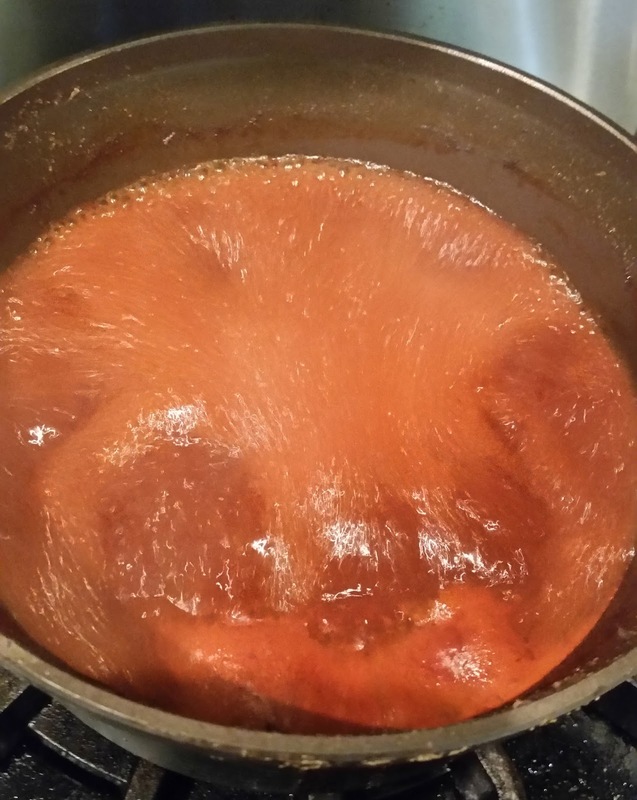 Bring to a boil, and then simmer for 1 ½ hours until the meat is very tender. Remove the meat from the pot with a slotted spoon. Shred the meat with two forks. Bring the liquid from the meat to a boil and reduce by half. I then added 1 cup of rich smoked pork stock (made from the bones and pan drippings from a small barbecued pig), and one cup of chile paste (see Competition Chile post for how to make this). Add a dash of ground cloves. Simmer the sauce. Add a very small amount of oil to a cast iron skillet. Toast corn tortillas until they get just slightly brown and barely crisp on both sides. 16 tortillas fit in the baking dish I use for enchiladas. Once all of the tortillas are cooked, add 1T of good lard to the skillet. Toss in a diced onion and cook until it is just soft. 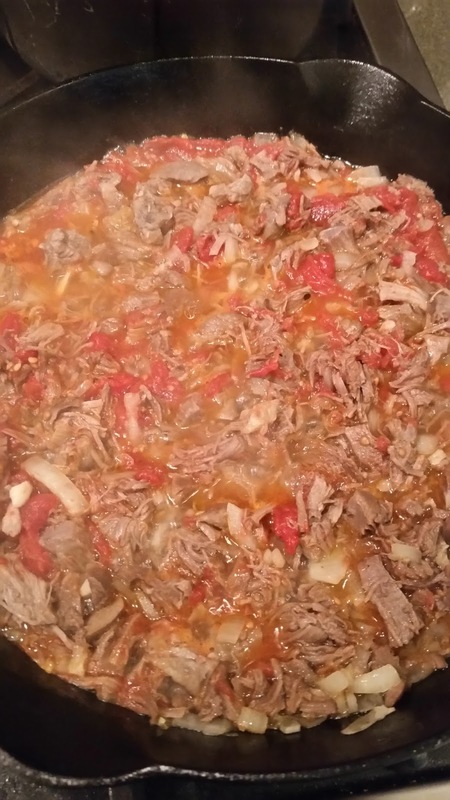 Add the shredded meat and a couple more smashed cloves of garlic. Add a pint of home canned tomatoes that have been crushed with a wooden spoon. Cook until all is heated through and the bits of tomato break down a little. Now it’s time to assemble the enchiladas. 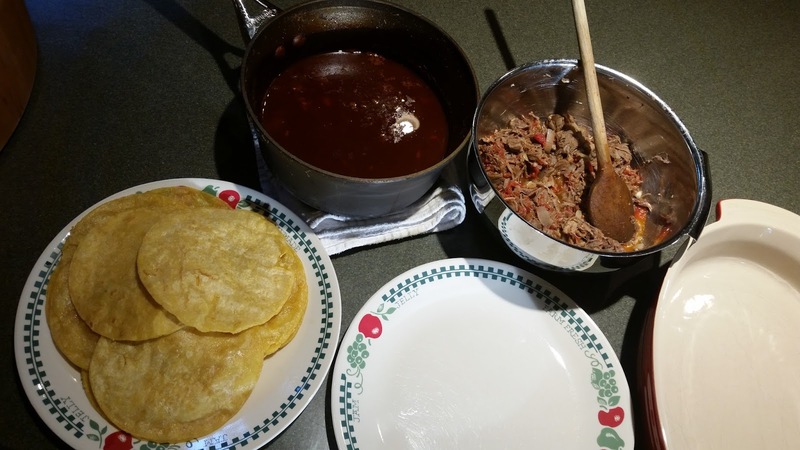 Set up a station with a dish to fold the enchilada, the pot of sauce, the meat filling, and the tortillas. Take a tortilla and dip it in the sauce. Set the moistened tortilla on the plate. Spoon on 3-4 T of meat, and roll the enchilada up. 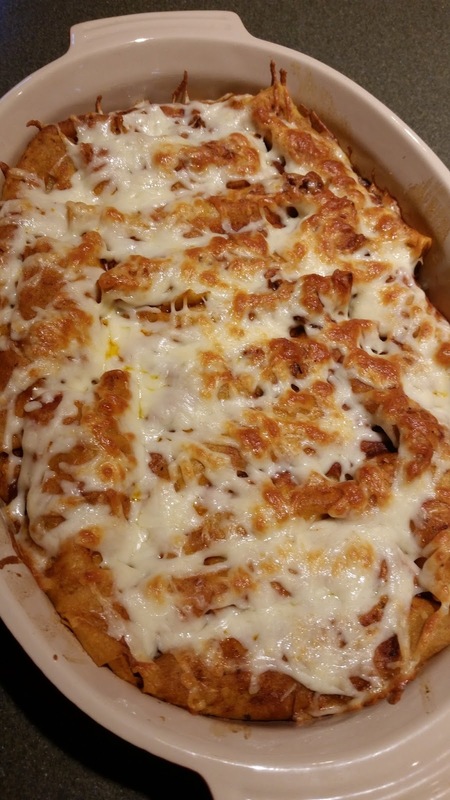 Place the enchilada in an oven proof baking dish large enough to hold all of your enchiladas. Once the baking dish is full, ladle more sauce over top of the enchiladas. Grate some Monterey Jack cheese over top, and bake for 30 minutes in a 350F oven. Don’t worry if you have leftover sauce. 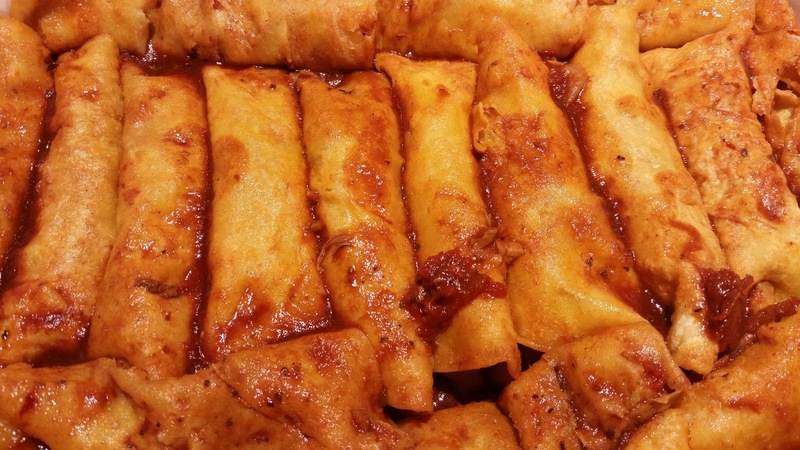 You can just make another batch of enchiladas in a few days. 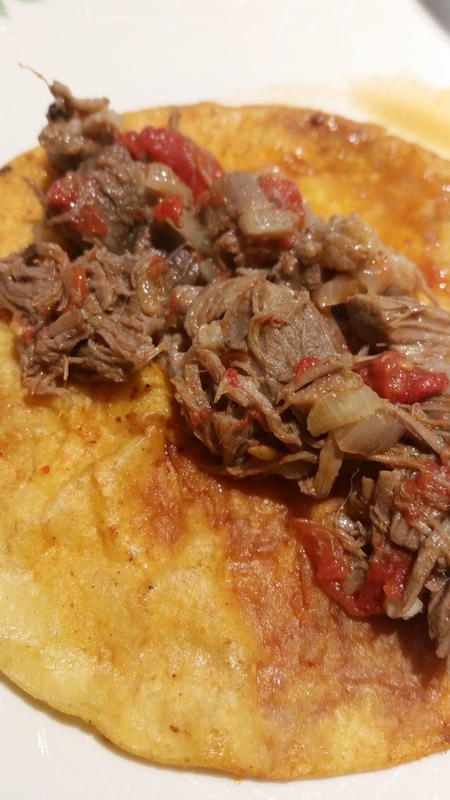 In fact, many times I will make extra meat, so all I need to do is cook some tortillas, roll up another batch, and, voila, an easy weeknight dinner.